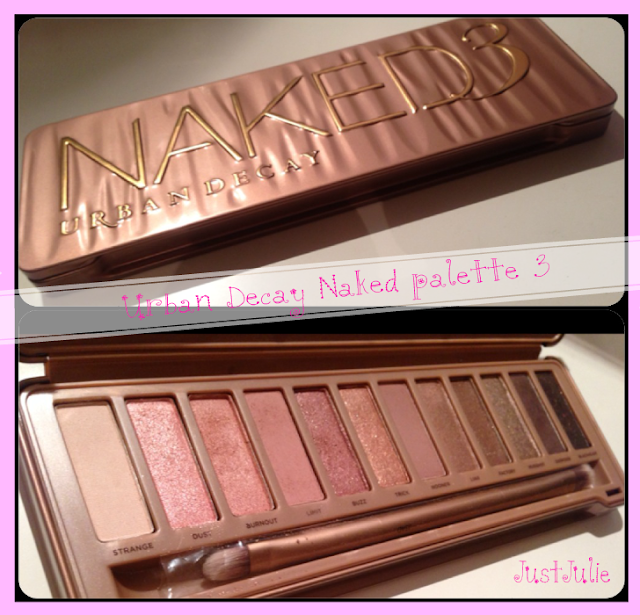 URBAN DECAY NAKED 3 REVIEW! 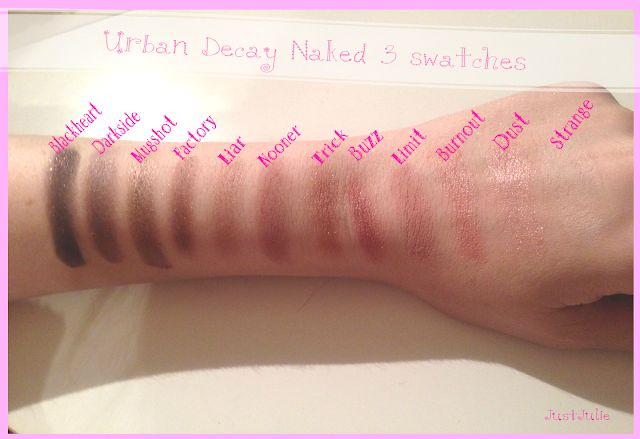 Unless you've been living under a rock over the past few months you would already know about Urban Decay's Naked 3 palette. I think pretty much every beauty blogger out there has already blogged about it, so why not throw another review about one of the most talked about palettes of 2013... and it wasn't even officially released until December! I don't have the first two palettes purely because I'm not really a natural eyes kinda girl BUT this one caught my eye. Whether it was the gorgeous rose gold packaging or the pinkier (is that even a word?!) toned eye-shadows or it could have been all the hype, either way I decided to purchase it. I had heard it was hard to get hold of and when I purchased it you could only get it from House of Fraser in the UK (aside from online retailers which at the time were just doing pre-orders) anyway I had no problems getting hold of it and was beaming with excitement as soon as I had it in my hands! I LOVE the size of the palette and LOVE the long mirror that comes with it, ideal for when you're on the go and wanting to do your eyeshadow whilst on the train, bus or tube. There are 12 eye-shadows, each weighs in at 1.3g which isn't too bad, it's only 0.2g less than a single MAC eye-shadow. Each of the eye-shadows are brand new shades to the Urban Decay range but I do hope they bring them out individually in the future as I just know I'm going to hit pan on a few way before finishing up this palette. The palette consists of just three matte shades (which is a bonus for me as I'm not a fan of mattes although I do like these ones) There's also a few glittery shades and a few shimmery shades thrown into the mix. I've been using this palette nearly every single day for the past month, so for a girl who doesn't normally do a neutral eye I'm definitely getting my moneys worth out of this palette! The thing is you can create a smokier effect with all of the eye-shadows and I'm really loving the pinkier (again is this even a word?!) smokey eye look right now as I think it's great for this time of year and I've also received quite a few compliments too, which is never a bad thing! As you can see all shades bar 'Dust' and 'Strange' are super pigmented. When I swatched the four darkest shades I had barely touched the pan, so it just shows you what great pigment you get from them. The matte shades are 'Nooner' 'Limit' and 'Strange' and I have to be honest, I normally despise mattes but I'm really loving these shades at the moment, 'Strange' is a great brow bone colour and the other two are fantastic crease colours and I've been using all three colours in nearly every eye look I've done over the past month or so! The glittery shades are 'Blackheart' 'Trick' 'Buzz' and 'Dust' Now with 'Blackheart' it looks on the swatch that there is a lot of glitter but I assure you that once this is applied on the eye there is barely any glitter! None of the glitter shades, bar 'Dust' offer too much glitter so they are easy to blend in, which is normally a worry for people when using glitter eye-shadows. I've heard a lot of people complaining about 'Dust' saying there is too much fall out, it's not easy to blend in and looks a bit chalky.... personally it's one of my favourite shades out of them all. I find it easy to blend it, yeah there's a bit of fall out but I will hold a tissue under my eye to catch any which doesn't add any extra time at all. I love to add a little bit of sparkle to an eye look sometimes and this shadow does just that without it looking OTT! The only shades I haven't really been reaching for are 'Mugshot' and 'Liar' I'm not sure why, there is nothing I dislike about these two shades they just really don't seem to be the shades thAT jump out to me, again maybe it's because generally I don't go for browny shades. I'll try to make a conscious effort to use them from now on! With the palette you also get a double ended brush. Normally brushes supplied with palettes aren't the best quality BUT they are actually great brushes so this is a big added bonus to the palette. Over all this is a great palette and I've really enjoyed using it for the past month or so. It's kind of given me a new found love for a neutral eye look as well as giving me the flexibility to create a smokier look too, which at the end of the day isn't that what we want from a palette, some versatility? You can purchase the Urban Decay Naked 3 palette for £37 from Debenhams, House of Fraser or many online retailers also stock it. Let me know your thoughts on the palette? If you could ask for one of the shades to be sold separately what one would it be?